The father of the man shot dead at Orly airport in Paris after attacking a soldier insisted Sunday that his son was "not a terrorist" and that his actions were caused by drink and drugs. Investigators were still trying to understand what motivated the assault by 39-year-old Ziyed Ben Belgacem, which led to a major security scare and the temporary closure of the capital's second-busiest airport. By Sunday afternoon air traffic had returned to normal, a spokeswoman for the Paris airports authority said. Saturday's drama began when Ben Belgacem, who was born in France to Tunisian parents, grabbed a soldier, put a gun to her head and seized her rifle, saying he wanted to "die for Allah". He was shot dead by two other soldiers after a scuffle. Ben Belgacem's father insisted his son -- who had spent time in prison for armed robbery and drug trafficking -- was not a extremist. "My son was not a terrorist. He never prayed and he drank," the father, who was in shock and whose first name was not given, told Europe 1 radio, blaming "drink and cannabis" for his son's actions. An autopsy was to to be carried out on Ben Belgacem's body Sunday to determine if alcohol or drugs were indeed a factor. 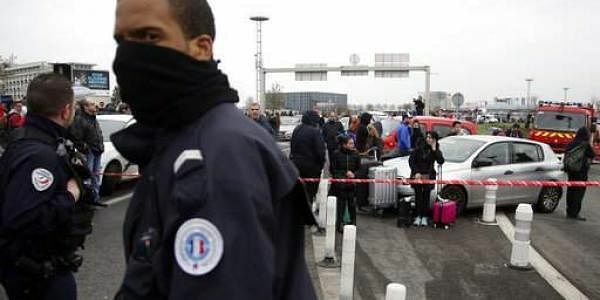 The attack at Orly comes with France still on high alert following an unprecedented wave of jihadist attacks that have claimed more than 230 lives in two years. Investigators were continuing to quiz Ben Belgacem's brother and cousin on Sunday for clues as to whether the gunman had planned a terror attack or decided to die as a self-described martyr after a bizarre shooting spree. He was investigated in 2015 over links to Islamist radicals forged in prison but his name did not feature on the list of those thought to pose a high risk. Ben Belgacem's standoff with the security forces began at around 6:30 am (0530 GMT) in the gritty northern Paris suburb of Garges-les-Gonesse, where he lived. After spending the night in a bar with his cousin, he was pulled over by police for speeding. Ben Belgacem drew a gun and fired at the police, slightly injuring one officer. His father told Europe 1 his son phoned him shortly afterwards "in a state of extreme agitation". On the departures floor he grabbed a soldier patrolling with two colleagues under the Sentinelle anti-terror operation, wrestling her to the floor. Molins said Ben Belgacem threatened the three, saying: "I'm here to die for Allah. In any case, people are going to die." He tried to use the soldier as a human shield but her colleagues managed to shoot him. Ben Belgacem was carrying a petrol can in his backpack, as well as 750 euros ($805) in cash, a copy of the Koran, a packet of cigarettes and a lighter. President Francois Hollande said Saturday his government was "determined to fight relentlessly against terrorism, defend the security of our compatriots and ensure the protection of our country".